Here are some more cards I made on my mass produce note cards weekend just gone. I made up 20 of these and used a few different sentiments so I have cards on hand. I use injection foam on my more intricate dies, which really helps with getting a clean cut which pops off the die. Make sure you have a firm 'sandwich' in your Bigshot. I placed the base magnetic plate, the acrylic plate, the die with the cut side facing upwards, the cardstock, the second acrylic plate and for these I added a cardstock shim. It was quick and easy to cut 20 of the intricate butterfly, and then I popped out the extra pieces with the paper pierce while I was watching TV. Thanks for popping by today. Hope to see you back here again soon. Hello lovely friends. It's time to share this weeks creation for the Stamping and Blogging Design Team. Are you playing along yet? We would love you to have a go at this weekly sketch. I'll provide details how at the end of the post. This card is for a lovely friend who needs some TLC. I think these types of cards can make such a difference to someone's day. I hope so anyway! I turned the sketch on it's side this week. The water-coloured image is gold embossed onto Watercolour paper and coloured with Blender Pens and the inside from the Perfect Plum and Old Olive ink pad lids. I love water colouring, I find it so therapeutic. Don't you just LOVE that black and white script paper from the Neutrals DSP stack? I am also loving using the new 2015-17 In Color Tip Top Taupe. Here's my colour combination this week. This is the sketch Sandi gave us to work with this week. Now it's time to visit my lovely stamping friends around the world to see what they have been creating. New Weekly Deals Today - Discounted Stampin' Up! It's Wednesday which means brand new products have been discounted. Here's what's on special in my online store this week until 11.50pm AEST Tuesday 2nd June. 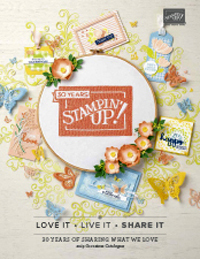 My stamp set is a new hostess set sneak peek from the 2015/16 Stampin' Up! catalogue, called A Whole Lot of Lovely. It's a great set of 4 stamps which coordinates with our 2" and 2.5" circle punches. I love using circles on my cards. It really balances the rectangle of the card. I used the new Triple Banner Punch (= totally LOVE this new tool) so was able to quickly create the banner ends on the 1" and 1.5" inch paper strips. I stamped the greeting just in one colour and added colour later with a simple punched flowers. By stamping and then punching I didn't need to be too precise with my stamping. I used the notecards and envelopes which are a perfect size and one quick stamp on the envelope customised the envelopes to match. 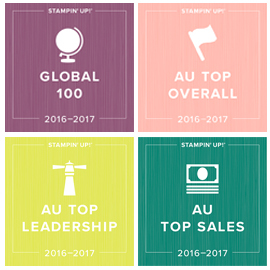 I loved using two of the new 2015/2017 Stampin' Up! In Colors on these cards too. Here is the colour combination for this project. I have some more notecard size cards coming up later in the week. These are fabulous to have on hand for quick simple cards. You can find them here in my online store. New Colours meets Retiring favourite for the Art with Heart Team May blog hop. 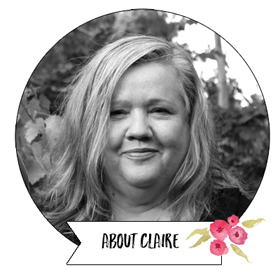 Today I'm bringing you another AWHT Blog Hop with some of the awesome ladies in the Art With Heart Stampin’ Up! Team. Today our focus is on our favourite retiring product, but many of us couldn't resist throwing in some new product too! I have used several of my favourite retiring products on this card. The Dictionary background stamp is beautiful for giving a fresh vintage look to your projects. I especially like ink the stamp up and placing the card on top and applying uneven pressure, so that a few areas remain un-inked, or only lightly inked. The Window Frame Framelits are another favourite. I love how you can mat the shape with a square piece of cardstock for an interesting effect. My favourite retiring stamp set is From My Heart. It's such a beautiful set with some really lovely images which also include greetings. Of course I had to throw in some of the new products I am loving too! As you can the new In Colour Mint Macaron is a firm favourite already. I am also totally LOVING the new triple banner punch. It makes creating banner ends so simple, because you can punch 1", 1.5" and 2" banner ends in a flash, using this great new punch. I used it to create the banner ends on the Pink Pirouette DSP and vellum on my card. Add this great punch to your wish list for ordering after June 2nd (It's on page 162, item 138292). Now it's time to move on to the next bog, my lovely team member Nikki Sadler. If you get lost anywhere along the way, here's the list of my team members who are participating in the blog hop this month. Thanks for visiting our creations today. We are always looking for more people right around Australia to join our fabulous team, so get in contact with me or any of the girls on the blog hop for more information.